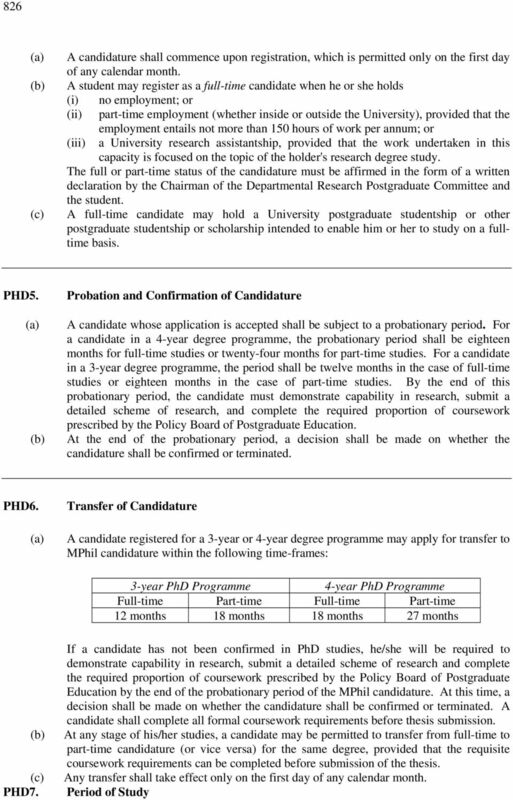 Download "REGULATIONS FOR THE DEGREE OF DOCTOR OF PHILOSOPHY (PhD)"
5 829 other qualifications, except in the case of a candidate who has registered in a PhD double degree programme of this University and another institution with which the University has entered into a formal agreement in respect of the programme. Original work of the student related to the thesis may be published prior to submission of the thesis and may be included in the thesis. PHD14. Examinations A candidate shall be examined by examiners appointed for this purpose both on the thesis itself, and at an oral examination on the subject of the thesis and/or the approved course of study and research. A candidate may also be examined by other means. A candidate s coursework shall also be assessed by examiners appointed for this purpose. PHD15. Coursework Examination Results Coursework shall be assessed on a pass/fail basis. 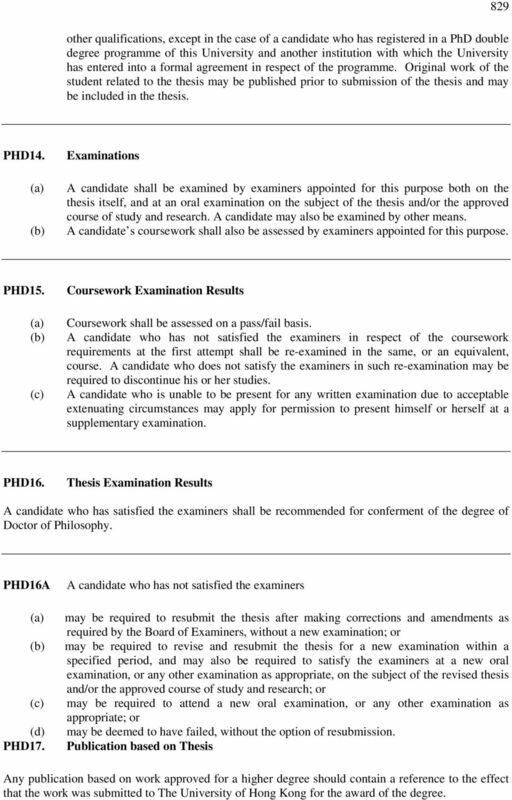 A candidate who has not satisfied the examiners in respect of the coursework requirements at the first attempt shall be re-examined in the same, or an equivalent, course. A candidate who does not satisfy the examiners in such re-examination may be required to discontinue his or her studies. A candidate who is unable to be present for any written examination due to acceptable extenuating circumstances may apply for permission to present himself or herself at a supplementary examination. PHD16. Thesis Examination Results A candidate who has satisfied the examiners shall be recommended for conferment of the degree of Doctor of Philosophy. PHD16A (d) PHD17. 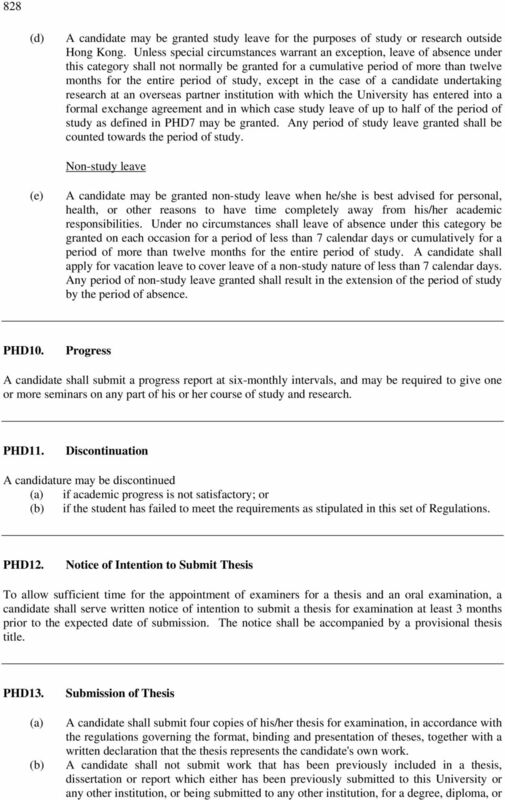 A candidate who has not satisfied the examiners may be required to resubmit the thesis after making corrections and amendments as required by the Board of Examiners, without a new examination; or may be required to revise and resubmit the thesis for a new examination within a specified period, and may also be required to satisfy the examiners at a new oral examination, or any other examination as appropriate, on the subject of the revised thesis and/or the approved course of study and research; or may be required to attend a new oral examination, or any other examination as appropriate; or may be deemed to have failed, without the option of resubmission. 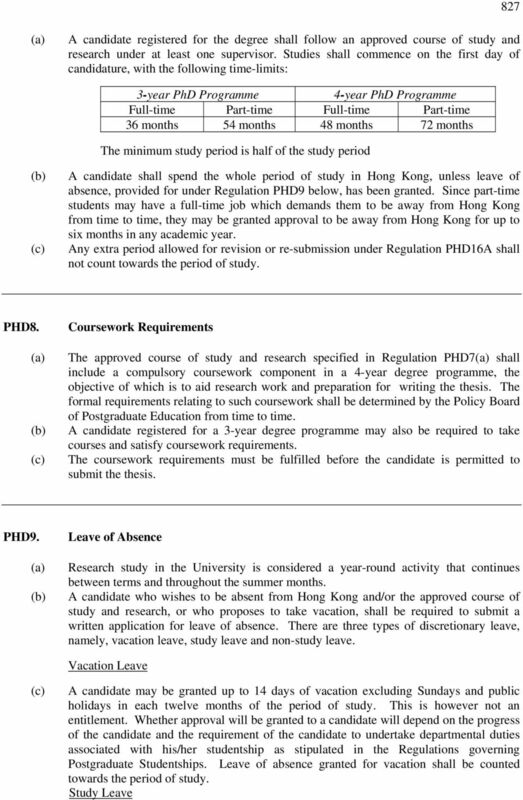 Publication based on Thesis Any publication based on work approved for a higher degree should contain a reference to the effect that the work was submitted to The University of Hong Kong for the award of the degree. Where these regulations require a member of the School's staff or a body of the School to act, this authority may be delegated where appropriate. [A series of papers, whether published or otherwise, is not acceptable for submission as a thesis. STATUTES GOVERNING DOCTOR OF PHILOSOPHY IN VARIOUS FACULTIES Existing Statutes 1. The Degree of Doctor of Philosophy may be awarded in such Faculties of the University as are recognized for the purpose. REGULATIONS FOR THE DEGREE OF MASTER OF BUSINESS ADMINISTRATION (MBA) These regulations apply to students admitted to the Master of Business Administration in the academic year 2014-15 and thereafter. 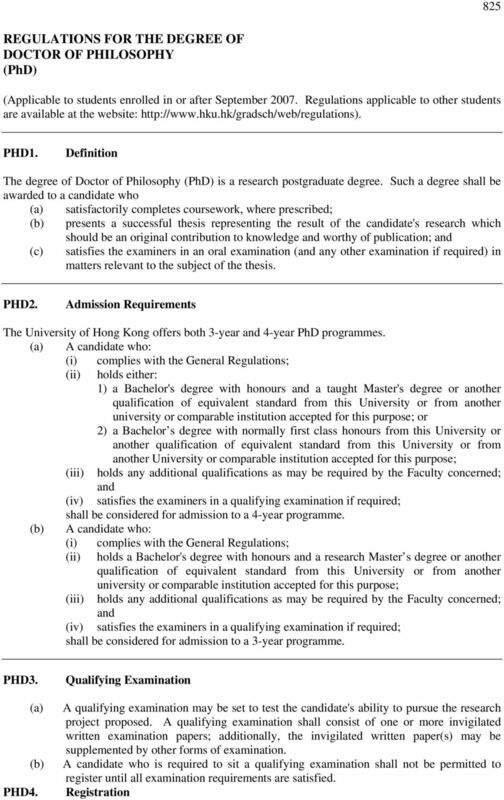 1 Definition of Terms 1.1 Wherever in these regulations the word `Faculty' appears, it shall be read as referring also to other institutions offering programmes of study which lead to an award of the University. The titles for Master's by Research degree are MLitt., MSc. and MEngSc. Master s studies in International Business at RU Rules and Regulations Master s studies in International Business at RU Rules and Regulations 1. Master studies in international business. 1.1. The Program.